Re: £10 > £20,000 - Sports betting. Steelers won 35-7 in the end to comfortably win my first bet. Packers currently up 28-27 and are running out the clock with under five minutes remaining. I fancy them to get another score and kill off the game. 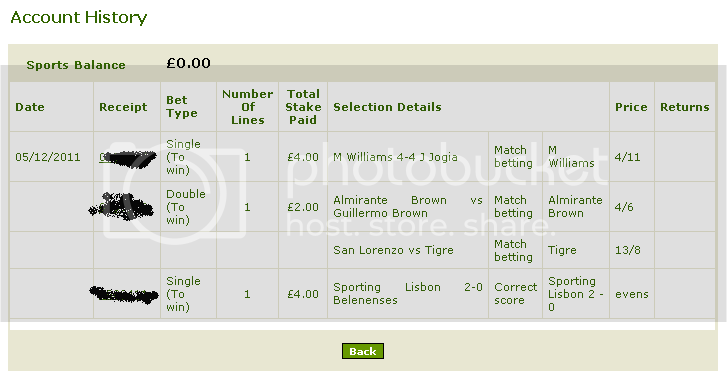 Well thats odd' date=' I got £110 back from the bet, which made my balance around £165 :S? That is the best kinda bet. Yup, Rodgers marches right down the field easy as pie to set up a last-second field goal for the win, which is.....GOOD! Saints do the business winning 31-17. Bank stands at £59.54, will look to put another bet or two on tonight. LOL. My gambling is a bit like Paul Rachubka at the moment. So out of form it is untrue. I think I need loaning out to a non-league club.. In 26 combined league games this season, Liverpool and Fulham have had one game between them that has featured more than four goals - Fulham's 6-0 win over QPR back in October. This will likely be my only bet of the night. In 26 combined league games this season' date=' Liverpool and Fulham have had one game between them that has featured more than four goals - Fulham's 6-0 win over QPR back in October. you will be hoping that its not a repeat of the 5-2 from last season. 19 quid on Mark Williams in the snooker when he was 1/6. Almirante Brown 1-0 up in the first leg of Pt3,hopefully they hold on to win as will be a good game the San Lorenzo v Tigres second part of it. What's that supposed to mean ? No bets for me tonight now and won't be on tomorrow till gone 8pm.